The 8890 & 8891 are dedicated multi frequency utility marker locator for professional locators. This offers companies the option to equip themselves with the capability of marker locating without purchasing expensive and redundant equipment. The 8890 & 8891 can locate the 7 major utility markers - power, water, sewer, gas, telco, and CATV - and a unique RYCOM frequency, in one easy to operate unit. The 8891-MP can also be ordered with any combination of needed marker frequencies. Choose water and sewer, telco and CATV, or power and telco frequencies for a locator that fits your specific needs. A scan feature allows the user to quickly identify any nearby marker and verify the frequency of each marker in the area. This is also useful for ensuring a marker is not misread. 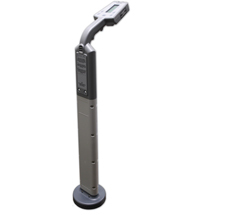 The utility marker will detect and isolate the highest reading during the scan and provide the frequency and utility. The ergonomically designed and balance receiver provides audible peak tones as the user nears a utility marker. The backlit digital display provides both relative and actual signal strength as well as the detected marker frequency. The highly sensitive antenna wheel conveniently folds under for compact storage in the included carry case. A 10 minute automatic shut-off feature reduces the need to replace batteries. Both units can detect marker depth and can locate 50Hz or 60Hz power utilities with a passive locating mode. Both the 8890 and 8891 are powerful locators and an excellent value for contract locators, power distribution crews, gas locating crews, CATV service crews, water departments, sanitation districts, telephone companies, DOTs, railroads and municipalities. Rycom Instruments®, Inc. locators are designed and manufactured to make utility locating as accurate as you need and as simple as you want. For more information on the 8890-MP, or any other Rycom Instruments® locator, please contact your local dealer or call us toll free at 1-800-851-7347.